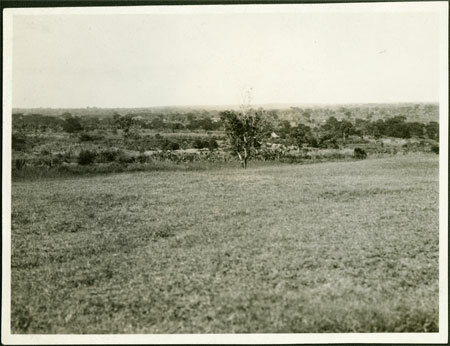 A view of sections of gardens or plantations in a valley. This film series has many subsequent images related to Evans-Pritchard's fieldwork in Zandeland, probably dating to 1930. One image from the same 23-1 series is found within the Nuer series, of a large river, and so this image may have been taken as Evans-Pritchard made his way to Zandeland after Nuer fieldwork during that year. Morton, Chris. "?Zandeland settlement" Southern Sudan Project (in development). 03 Jan. 2006. Pitt Rivers Museum. <http://southernsudan.prm.ox.ac.uk/details/1998.353.18/>.